The addition of these new e-mtb’s along with their unique story sparked my interest and I recently visited their headquarters and assembly facility in Pompano Beach, Florida, just north of Miami. During the time I was at Prodeco I talked extensively with Rob Provost (CEO), Daniel Del Aguila (co-owner), and Jim Aversa (co-owner) about the history of Prodeco and what the future holds for this American e-bike company. About 5 years ago Robert, Daniel and Jim began importing “container e-bikes” from China for distribution and sale in the US. E-bikes can be bought by the shipping container from factories in China, hence the name “container e-bikes”. They branded these bikes as Eco-Tech bikes. After dealing with quality issues of these stock e-bikes they began to tear down these bikes and rebuild them with better components and with more attention to assembly details. It got to the point where they were replacing almost everything on these bikes. Since they were almost building these bikes from scratch they decided to create their own bike designs and build bikes that really fit what people wanted. And they decided to assemble their new bikes at their Pompano Beach, Florida location. E-bikes assembled by American workers! 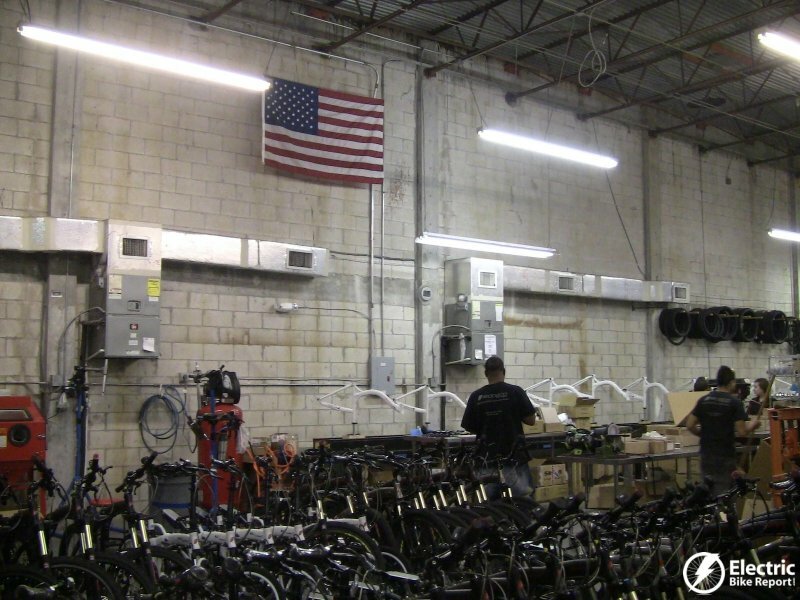 They get their frames and almost all of the components from China and Taiwan, but the bikes are assembled from the bare frame up to complete bikes in Pompano Beach. 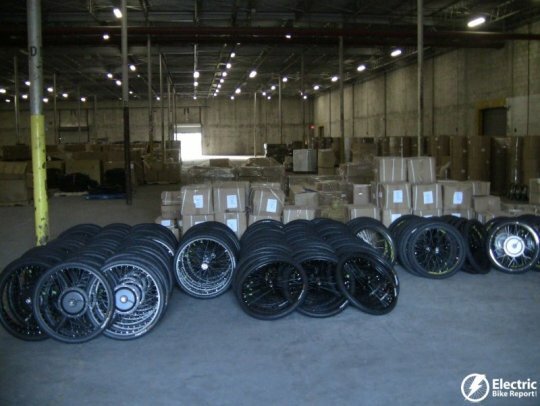 Even the wheels are built up at their facility. During the time Robert, Daniel, and Jim were selling the Eco-Tech bikes they had learned a bit about what people wanted in an e-bike. They studied the market of people that would be interested in electric bikes and asked them what features were important to them. They attended many events where they could gather information on what people wanted in an e-bike. From their research they determined that their typical e-bike rider was looking for a bike that was stylish, easily portable (foldable), durable, easy to maintain, and economical. During 2008 and 2009 they worked hard to develop the bike designs and bike specs to create the e-bikes that fit what their market wanted. In 2010 the market responded with overwhelming enthusiasm. The hard work that they had put in to dial in their e-bikes payed off with a lot of demand. Since 2010 they have been working hard to keep up with the demand of the bikes from their dealers around the US and in South America. 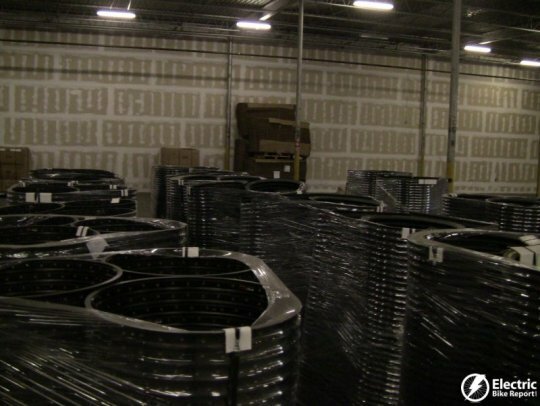 Currently Prodeco employs around 50 people and they have their production facility and headquarters spread out among 3 buildings in the Pompano Beach area. 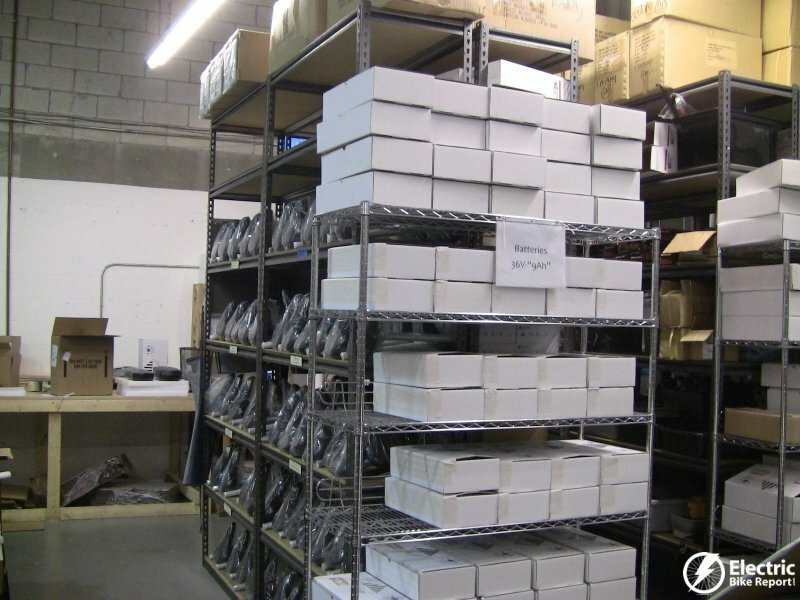 With the bikes being assembled on site, they need to stock a few parts in their warehouse…..3 million parts (plus or minus a few)! These parts are for the new bikes as well as providing replacement parts to dealers and customers when they need them. 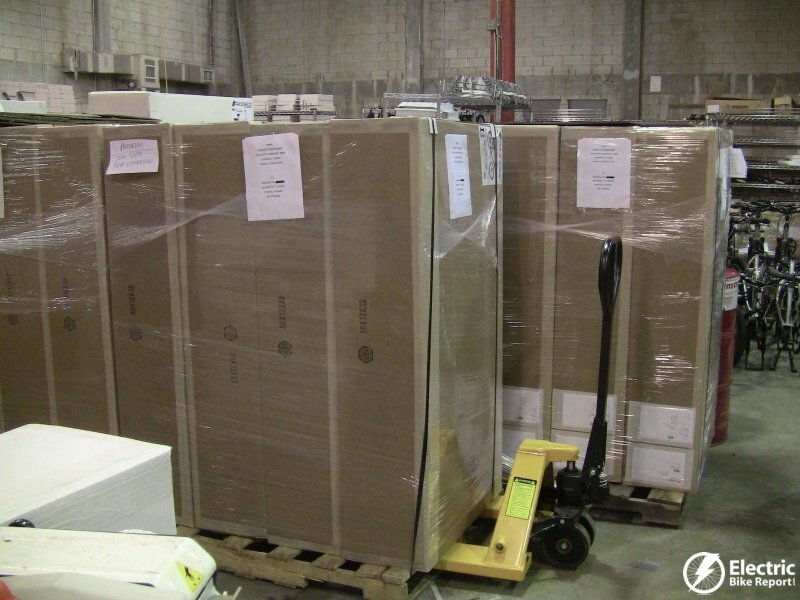 Prodeco can have a part to a dealer within 24 hours. In order to improve their production capacity they are in the process of moving to a new facility that has 60,000 square feet of potential space for the assembly facility, warehouse, and offices. With the expansion to the new building they will be growing their workforce to over 100 US workers soon. The new facility will allow Prodeco to produce 192 bikes in an 8 hour shift. 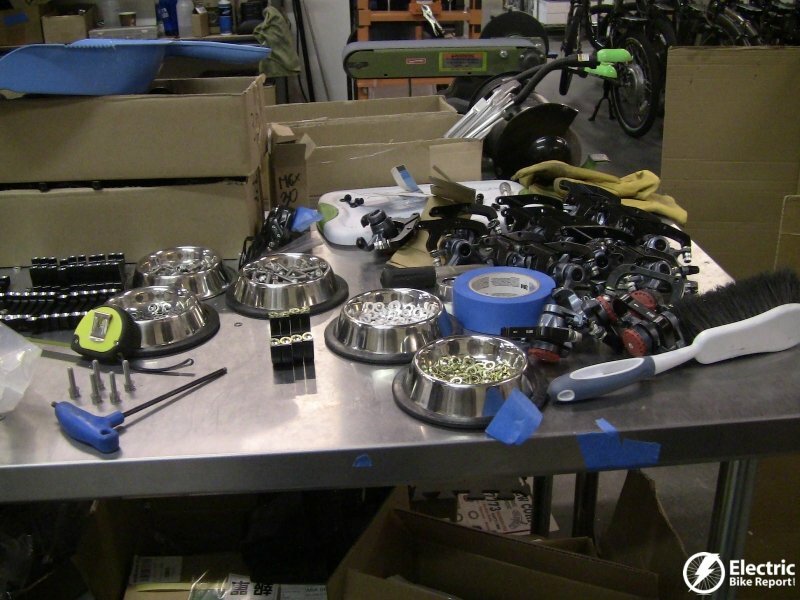 It typically takes 6-7 hours to build and quality check one of their bikes. The new facility will be much more sophisticated compared to their current facilities. The assembly lines will be very organized with the flow of work being as optimized as possible. When I visited the new facility it was in the early stages of being outfitted. 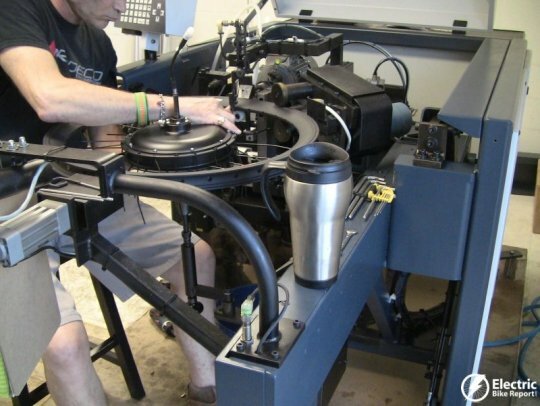 Prodeco recently installed a Holland wheel building machine that automates the wheel assembly, while workers still quality check each wheel. 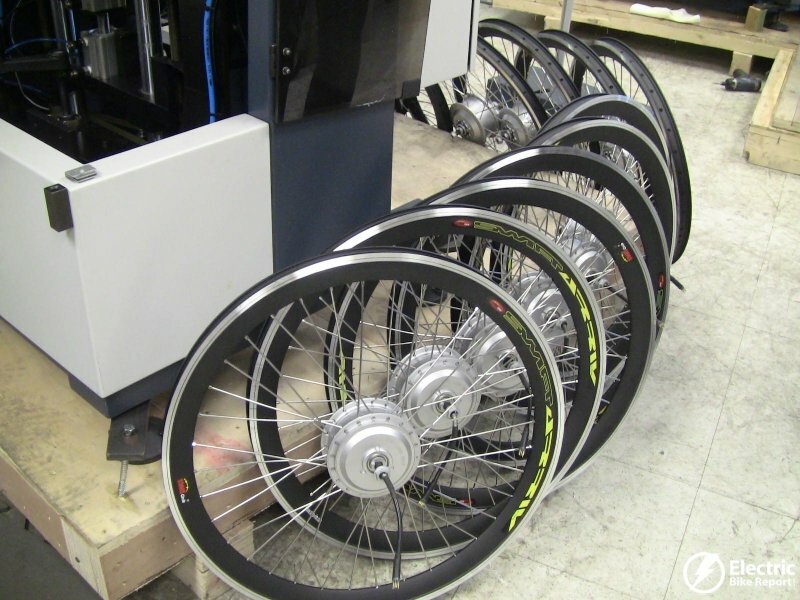 They will also be investing in a tire installation machine that will reduce the tire installation time for each wheel. When the new assembly facility is up and running Prodeco estimates that they will assemble and sell close to 15,000 electric bikes in 2013! Robert said that they look for people who would like to make a career out of working for Prodeco. They invest a lot of time and money training their staff and they are hoping that they will stay for the long term. The new facility is close to good neighborhoods where workers may live. In addition to investing in their employees, they are planning on investing in their dealers. Robert said that once the new facility is in operation they will invite dealers to their assembly facility to show them the behind the scenes action and provide product training. Currently Prodeco has around 200 dealers in the US and South America. They are focused on expanding their dealer network as they increase their production capacity with the new facility. Like other companies, Prodeco has had it’s fair share of growing pains. Recently they had to stop working with a few dealers because they were not treating their customers well. Some of these were online dealers who were not following the rules. Going forward, all dealers must have a physical store and service center. Some people have complained that it is hard to get in contact with Prodeco. They are working to improve their response to potential customers but their priority is to get back to existing dealers and customers very quickly. Robert is focused on consistent growth for the company. He mentioned that Prodeco has financial partners that have provided the resources for the new facility and future business expansion. Checkout part 2 of the report from the Prodeco Technologies headquarters visit where I cover the bikes that I test rode, how Prodeco is able to offer a lot of e-bike for a low price, and their commitment to constant improvement. dealer in the Sacramento/SanFrancisco area? Electric Bicycle Outlet https://www.electricbicycleoutlet.com according to Prodeco’s FB page. Nice report, Pete. Especially liked the opportunity to “see” inside the factory. But I really can’t wait for the reviews of the bikes themselves!!! Thanks Senior Biker! The next part will have a quick review of a few bikes I rode while at the Prodeco headquarters. Stay tuned for full bike reviews coming soon! i know your Jonesing Search Prodeco e bikes on line specs catalog They come in a wide range to fit your needs 250/750 watts street legal & 1 dirt devil right now their all under $2K free shipping & a great warranty offered You’ll see it’s a lot more information that can be told here Best of luck ! I wanted to buy a Prodeco bike earlier this year. After numerous calls when no one ever answered the phone, I left a voicemail message. No response. Then I sent them an email saying that I wanted to buy one of their bikes. No response. Then I ordered one through my local bike shop, which was a Prodeco dealer, but the bike shop was not able to get the bike and did not get telephone responses either. After three months of waiting, I cancelled the order. I know they were overwhelmed with orders for quite a while. I have found the best response comes from leaving a message on their Facebook page. Or call their 800 # and hit extension 5. Patricia usually picks up and she’s really great about helping; she’s help me out several times. I’ve had my bike since April and service has been stellar (I broke my seat rail and had one two days later!). Who was the dealer? This is the first time I hear of a dealer not getting in touch with us. Customers who requested a bike directly have had a hard time to speak with us at the beginning of this year and during those times we preferred our dealers work directly with consumers. We concentrated on building the best bikes and expected the dealers answering the questions for potential customers. Dealers have direct contact at the company with a direct line. We do not have a sales department to the public but our dealers do have a rep assigned to them and we are on a first name basis with all our dealers. Some dealers even have direct cell phone numbers to us. We did have an issue with not enough people in customer service at the beginning of the year with the flood of calls and emails coming in from the public but we have since increased that department. Currently, we check all incoming emails and voicemails very carefully to assure we are responding quickly. Our comments on Facebook are also answered usually in less than 24 hours. We have tried very hard this year in making ourselves accessible to everyone including sharing our story. There is a chance the dealer may have not been a Prodeco Tech dealer but we would be more than happy to talk to them. The dealer may also have stated that to push another model. It just seems odd and the reason we were so busy is due to dealers contacting us and buying the bikes. With the new facility opening full steam ahead next month and the 2013 bikes now starting production, we welcome strong dealers across the USA to offer our bikes. As an unsatisfied Prodeco customer I found this report interesting. With facilities and resources the Prodeco line should be able to provide bikes capable of delivering a quality reliable commuter ride. Yet despite Herculian efforts I still have a bike that has needed the skills of mechanic the foresight of a machine maintenance technician and the patience of Job to keep on the road. From a system so fragile it cannot be ridden even in a light sprinkle nor withstand roads of less than pristine surfaces to original assembly practices that never could be expected to endure daily riding this bike has tarnished my expectations. I am on my 3rd battery and second mounting system. The disc brakes have fallen off the wheels, battery platforms mounted with aluminum ‘pop’ rivets and a folding system that is ungainly and unusable in common applications. I have worked closely with Rob and he has been kind but when he turned me over to one of the owners the lines of communication went dead even after I went to great ends to provide photos and descriptions of the difficulties I’ve faced. So I am left with a ride I can not use as a daily commuter that spends allot of my time being reworked so the battery doesn’t fall off and Prodeco gets to flaunt how they build fancy bikes for people with more money than riding needs. Sorry but puff pieces for unworthy products bug the h*** outta me. Yikes, Jeff, sounds like a rough experience. Not at all like mine, with my Prodeco bike, however. Have you tried any other brand of e-bike to see how it holds up to your commute? I never received the message that you wanted to speak with me or communicate with me and I apologize about that. I would be more than happy to discuss any issue you have had with your bike. I spoke with Rob Lindsay and Jose today and they did mention you wanted to speak with me in September while I was at Interbike. Please feel free to contact me at [email protected]. You should not have to experience any negative issue with the bike and if you have, I personally will assist to make it right. You should be enjoying every time you are on the bike. The original battery design you mention was an aluminum case with 2 plastic ends. One end had a handle that would be pulled to remove the battery. This design is widely used in the USA and Europe now. We did not develop that design but the inside of the battery was ours. The case was 3rd party and utilized for 6-8 months. Millions of these cases are used in the industry and have been for years. We were upgrading the bikes to 36V from 24V and needed a new case design. The beginning of this past summer we utilized a revision of our 24V system to now house the 36V group of cells. Where the 36V 6Ah and 9Ah were no issue, the 12Ah had a small weight issue with the increased cells. The weight issue caused a minimal % to have the slot chipped at and could fracture. The revision is now out and we increased the thickness by 100% at the slot and 50% throughout the entire case besides using a different more flexible ABS composite plastic. The original version may have been too brittle. The new thickness and ABS took care of the problem. We of course can do the same for you. I truly do apologize for any inconvenience and this is something we can take care of right away, tomorrow if needed. We are also just completing an alloy rack system which mounts over the battery completely. This will be out shortly and allows heavy bags to be placed on the rack instead of the battery. The bike can also be picked up by the rack and the battery is protected all the way around by the rack. The rack is not required but nice for someone who wants to carry more than 10lbs. Jeff, please feel free to contact me, the email address again is [email protected]. I will be more than happy to have our team work on any issue you experienced and get it taken care of. I am sorry I did not get to work with you directly when you originally had the issue. The bikes can and do hold up to rough terrain. Your situation seems excessive but we will take care of it. Prodeco need to get better with their customer service and not leave customers high and dry. I tried calling 3 times last week and never got an answer, they didnt reply to my emails either. Flat tires are very hard to fix. Hey Rich, did you email [email protected]? I always get a response within 48 hours. If that doesn’t work, try calling the # and hit extension 5. These are both what they suggest on their facebook page as ways to ensure contact. Which model do you have? I’ve repair two flats on my Stride (no problem) and now have thorn-proof tires, valve extenders, on the bike so no more flats! Rich, can you tell me which number you called and which email address? Did you leave a voicemail? The reason I ask is we have no unanswered emails or phone calls from last week. A few months back we put in place a response log and take the the responding to customer service inquiries very serious with a maximum 24 hour response time. Almost all get responded to within a few hours if during business hours. Our days of operation are Mon-Fri, 9Am to 6pm. Until the break in the lines of communication when it got ‘kicked upstairs’ I had always been satisfied with response time and while my opinion of the content may (well its my opinion) Rob in CS was pretty fair ’bout staying in touch. I was comforted by the effort they extended to solve my problems. There are other reasons for the situation but I got thru easily with e-mail after initial phone calls directed my contacts into the company. One Prodeco company line will help avoid some of probs like mine…having the option of seeing bikes in bricks and mortar should enlighten people to the level of 2 wheeled resource they are investing their money on. A good study visual-wise could go a long way to being a happier owner and local shops may be more inclined to see and grasp where a customer is seeing problems to make solutions. I had hoped the e-bike marketplace had matured to the age to have a product for me and hopefully I will return to the marketplace when the products are as versitle, reliable and convenient as the bicycle it evolved from. Until then I shall make the best of my Prodeco and its quircks and challenges. I do not think that this tale is typical (I sure hope not!) but I want to share it here. I will cut this long tale down to the bare bones. We wanted to buy a 2013 Prodeco Black Stride 500. There is no local dealer in Victoria, so we ordered one from Seattle EBike. It arrived in May 2013 via the ferry, but it quickly became clear they had sent us the wrong bike – a 2012 model. It took them four weeks to acknowledge their error, after some arguing, and get the 2013 model to us. Since they wanted the 2012 model back unridden, we were four weeks with a bike we could not use! Within a week of getting the 2013 model, the motor failed. Seattle EBike claimed this was no longer their problem, and directed us to deal with Prodeco in Florida. 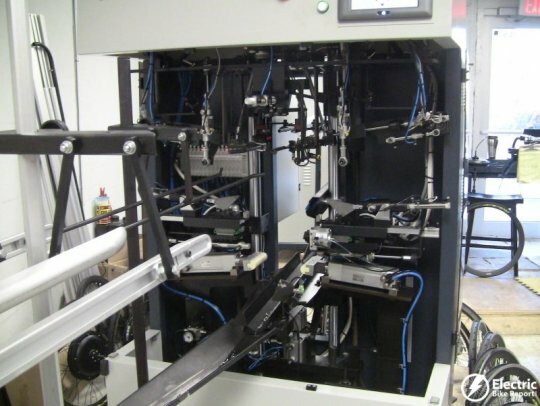 Prodeco tried to solve the issue initially with a new motor controller, which took another four weeks to reach us – it did not solve the problem. Finally they sent us a new rear wheel/motor via their Canadian distributor, with another three weeks of waiting before the problem was finally fixed. In total we had a Prodeco bike for 11 weeks which we could not use! Granted, some of this time is due to our being far from their dealer and factory, but we are in a large city and mail and couriers do function in Canada as well! That said, we are quite happy with the bike now. It serves well on daily commutes of about 22km, needing a recharge only every three days (the motor is used only for hills etc.). We did put fenders on the bike, as it rains here often, and cover the battery with a plastic bag – the battery tray and electronics are not as well protected from water as they could be! We also modified a seat-post-mounted carrier tray to handle panniers wide enough to get around the battery tray. Prodeco has since informed us that due to our complaints and those of others, they have revamped their customer service system, and instituted a review of dealers. I believe they are certainly trying to make improvements! i hope you will sell in the philippines someday.